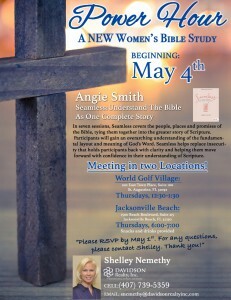 Women’s Bible Study Kicks Off May 4th in World Golf Village! Come one, come all! Davidson Realty agents Shelley Nemethy and Pam Lareau are hosting a new women’s Power Hour Bible Study starting tomorrow, May 4th at Davidson Realty’s World Golf Village office. The 7-week Bible Study is based on the book Seamless, written by Biblical teacher and author Angie Smith. The study will focus on understanding the Bible as a whole and is a perfect fit for anyone regardless of knowledge of the Bible. Shelley will host the World Golf Village study on Thursdays from 12:30 to 1:30 p.m. at 100 East Town Place in St. Augustine. Pam hosts the Jacksonville Beach study on Thursdays from 6 to 7 p.m. at 1500 Beach Boulevard, Suite 215. Holiday Toy & Food Drive This Saturday, December 3rd at the King & Bear Amenity Center! Attention neighbors and friends! 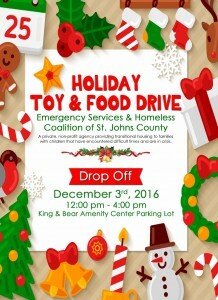 Davidson Realty agent Mirtha Barzaga is hosting her annual holiday toy and food drive benefiting the Emergency Services & Homeless Coalition of St. Johns County (ESHC) this Saturday, December 3rd from 12 – 4 pm at the King & Bear Amenity Center. ESHC works to help break the cycle of homelessness for local families and children. The drive is co-sponsored by the Neighborhoods of World Golf Village and the King & Bear. ESHC is in need of new, unwrapped toys and non-perishable food items such as beans, vegetables, noodles, soups, ham, tuna, salmon, etc). They are also in need of baby items, cleaning products, paper products, Christmas decorations and more. To see a full list of needs, click here – http://homelesscoalitionstjohns.com/donate-items/. All are invited to join Davidson Realty agent Mirtha Barzaga as she hosts her annual Thanksgiving food drive in Heritage Landing on Saturday, November 12! 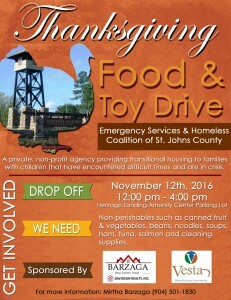 Donations will go directly to the Emergency Services & Homeless Coalition of St. Johns County (ESHC). 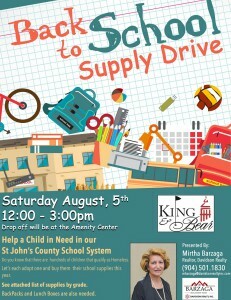 The drive will take place between 12 p.m. and 4 p.m. at the Heritage Landing Amenity Center at 100 Heritage Parkway. The drive is co-sponsored by Vesta Property Services. ESHC works to help St. Johns County’s homeless families with children to find the road to self-sufficiency. Interested donors are invited to bring non-perishable items like canned fruit and vegetables, beans, noodles, soups and canned meats. Cleaning supplies are also requested. 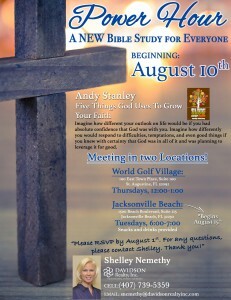 Davidson Realty Agent and published Christian author Shelley Nemethy will host a community Bible Study called James: Mercy Triumphs starting Thursday October 6th at Davidson Realty’s World Golf Village headquarters. The Bible Study will be held every Thursday night from 6:30 to 8:30 pm for eight weeks. James: Mercy Triumphs is written by Biblical teacher and renowned author Beth Moore. Beth is founder of Living Proof Ministries and the author of bestselling Bible studies and books for women. 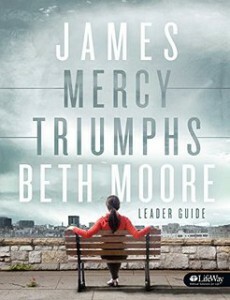 According to the James: Mercy Triumphs website, the course centers on, “joy, hardship, faith, reversal of fortunes for rich and poor, wisdom, gifts from above, single-mindedness, the dangers of the tongue, humility, and prayer.” Shelley said every Beth Moore Bible Study she has ever done has been life changing. Shooting for SAYS – Help Support the Boys at St. Augustine Youth Services on October 20th! Davidson Cares, the corporate giving program of Davidson Realty, is excited to announce their 1st Annual Shooting for SAYS Event on Thursday, October 20th at Jacksonville Clay Target Sports! Since the Davidson family is passionate about shooting sports, they thought an afternoon of shooting with friends to raise money for St. Augustine Youth Services (SAYS) would be an excellent new tradition for Davidson Cares. All proceeds from the event will benefit the boys at SAYS, which provides a safe, therapeutic home for boys 6-18 years of age that have suffered from severe abuse and neglect. SAYS takes in boys from all over the state of Florida. With the increase in new residents coming to Northwest St. Johns County, we have also seen new opportunities to meet people and build on World Golf Village’s already strong sense of community. 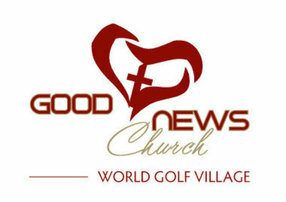 The latest addition to our area is Good News Church, located off International Golf Parkway just east of Interstate 95. Pastor Andy Hirko and church members opened their doors on Sunday, April 17, welcoming 990 people to just the first two services. The congregation has since continued to grow in size.